Chatham County is a county located in the Piedmont area of the U.S. state of North Carolina. As of 2000, the population was 49,329. Its county seat is Pittsboro. It is part of the Durham-Chapel Hill Metropolitan Area. Some of the first settlers of what would become the county were English Quakers, who settled along the Haw and Eno Rivers. The county was formed in 1771 from Orange County. It was named, like Pittsburgh, Pennsylvania in 1758, for William Pitt, 1st Earl of Chatham, who served as British Prime Minister from 1766 to 1768 and opposed harsh colonial policies. In 1907, parts of Chatham County and Moore County were combined to form Lee County. The award-winning PBS documentary Family Name notes Chatham County as the place the relationship between the African-American and European-American branches of the Alston family originated. George Moses Horton, Historic Poet Laureate of Chatham County, (1797?-1883) lived most of his life in Chatham County and is among the few slaves to have published material while still a slave. Moncure once served as the western-most inland port in the state, linked all the way to the coast by steamships. 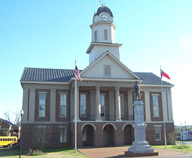 On March 25, 2010, the Chatham County Courthouse, built in 1881, caught fire while undergoing renovations. For more information, see Pittsboro, North Carolina. The county is one of three counties that have known minable bituminous coal deposits in the state. The area along the Deep River, which forms the border of Chatham and Lee County and Randolph county was a major coal-producing area between the Revolutionary War and the Great Depression. It was called the Deep River Coal Field. The communities of Carbonton and Cumnock (formerly called Egypt in Lee County) originated with development of the coal mining industry. Much of the coal mined in the field during the Civil War was used to fuel Confederate operations. A fatal explosion at the Coal Glen mine disaster in the 1920s, along with frequent flooding by the Deep River, sealed the fate of the mines; they were all closed by the 1940s. Recent attempts to tap the coal have proved failures; geologists say the coal is too highly faulted and the threat of explosive gases underground is too high. In addition, the high-sulfur coal cannot be economically used under environmental laws that have succeeded in reducing air pollution. Geologists once thought that natural gas and oil might also exist in the area where the coal mines were, but none that is economical enough to be pumped has yet been found. 96% of the coal mined in North Carolina comes from Chatham County, the other 3% comes from small quarries in Randolph and Lee counties. The county was long dependent on agriculture as the basis of the economy. The area's relatively unfertile natural soil conditions (composed mostly of the hard red clay soil common to the Piedmont), did not support the cultivation of commodity cash crops such as tobacco; this was never important in the county's economy. The production of livestock has always been more important to the county, especially the breeding of cattle and poultry. The county once had a thriving dairy industry, but in recent years most farms have been sold and developed. The county is one of the state leaders in the poultry industry, being home to several large poultry-processing facilities. The poultry industry in the county is centered mainly around the western part of the county near Siler City. Townsend Foods and Golden Poultry are the largest poultry companies in the county. Forage crops such as hay are also grown in large quantities in the county. Carolina Farm Stewardship Association has been housed in Chatham County along with many organic agriculture farmers. Industrial growth in the county has been focused around the Siler City and Moncure areas of the county, with Moncure dominating. Companies in that area include, Progress Energy, Weyerhauser, Honeywell, and ATC Panels. Brick manufacturing, which makes use of the local red clay soil, has been an important economic factor in the Moncure area, with several brick plants operating there and in Brickhaven. 3M operates a greenstone mine south of Pittsboro along US 15-501. Greenstone is processed to manufacture roofing-shingle granules. In 2007, residents opposed to industrialization successfully blocked a similar quarry from being developed in the western part of the county. The scenic rural environment has attracted many artists (Chatham Artists Guild), and arts-related tourism is a growing economic influence. Chatham County is the location of the Shakori Hills Grassroots Festival of Music and Dance. The four-day outdoor festival is held twice each year, in April and October. Artists who have performed at Shakori Hills include Patty Loveless, Ralph Stanley, Hugh Masekela, Donna the Buffalo, Carolina Chocolate Drops, Avett Brothers and Jim Lauderdale. Shakori Hills is also the location of the Hoppin John Fiddlers Convention and Mountain Aid benefit concert. A five-member Board of Commissioners governs Chatham County. The commissioners are elected at large, but must reside within a particular district. The members of the Chatham County Board of Commissioners are elected for four-year terms, but the terms are staggered so that all five seats are not up for election at the same time. The November 2010 election cycle brought an historic change to the political landscape with the election of three republicans; Brian Bock, Walter Petty, and Pamela Stewart. Only one other republican (John Grimes) has ever been elected in Chatham County since Reconstruction after the Civil War. Commissioners appoint a county manager who administers the day-to-day business of the county, including personnel and budget oversight. The Board of Commissioners also appoints the county attorney, clerk to the board of commissioners who is responsible for meeting agendas and minutes, and the tax administrator who manages all tax office functions, but they do not appoint other county staff positions. The Board of Commissioners does have general authority over county policies, but several other boards have authority over specific policy areas, such as the Board of Health, Board of Social Services, Board of Elections and Soil and Water Conservation District Board. The Board of Commissioners appoints all members of the Board of Health and makes some of the appointments to the Board of Social Services, but neither the Board of Elections nor the Soil and Water District Conservation Board have any commissioner appointments. Chatham County is a member of the regional Triangle J Council of Governments. A Chatham County native, Joe Hackney, is currently (2010-2011 session) serving his 15th term in the N.C. House of Representatives. He has served as speaker pro tem, house majority leader and house Democratic leader and was elected speaker of the house in January 2007. He is consistently rated by his peers as one of the ten most effective legislators, according to the N.C. Center for Public Policy Research. He is president-elect of the National Conference of State Legislatures. The county is divided into 13 townships: Albright, Baldwin, Bear Creek, Cape Fear, Center, Gulf, Hadley, Haw River, Hickory Mountain, Matthews, New Hope, Oakland, and Williams. Chatham County contributes funds to, but does not govern, K-12 public education and the community college system. The Chatham County School System is governed by its own elected board. There are three public high schools: Northwood in Pittsboro, Jordan-Matthews in Siler City, and Chatham Central in Bear Creek. A new middle school is scheduled to be built off Andrews Store Road near the new Briar Chapel Community in northeast Chatham by November 2010. A new high school is scheduled to be built on Jack Bennett Road in northeast Chatham by August 2012. Chatham is home to two charter schools - Woods Charter School and Chatham Charter School. Woods Charter School is a grade K-12 public school. The school moved into a new fully equipped building on 160 Woodland Grove Lane outside Pittsboro in August 2008. Woods ranked "top ten" on SAT scores in North Carolina. Chatham Charter School is a grade K-8 public school. The school is located on 2200 Hamp Stone Road in Siler City, NC. Central Carolina Community College, which has two campuses in the county, is governed by its own appointed Board of Trustees. Generally, county resources provide only part of the total funding for K-12 and community colleges, but the county devotes a considerable amount of its resources to public education. In FY 2007-08, more than 39% of the county’s tax dollars went to education. According to the N.C. Association of County Commissioners Annual Tax and Budget Survey for FY 2006-07, the county ranked 11th in the state in total spending per student and fifth in the percent of the current expense/general funds spent on schools per student. The county also was 14th in overall education resources per capita during FY 06-07. There were 19,741 households out of which 28.80% had children under the age of 18 living with them, 56.30% were married couples living together, 10.00% had a female householder with no husband present, and 29.80% were non-families. 24.50% of all households were made up of individuals and 10.00% had someone living alone who was 65 years of age or older. The average household size was 2.47 and the average family size was 2.91. In the county the population was spread out with 22.50% under the age of 18, 7.30% from 18 to 24, 30.40% from 25 to 44, 24.60% from 45 to 64, and 15.30% who were 65 years of age or older. The median age was 39 years. For every 100 females there were 96.80 males. For every 100 females age 18 and over, there were 93.80 males. As of the census of 2010, there were 63,505 people and 24,877 households residing in the county. The population density was 93.1 people per square mile (36/km²). There were 28,753 housing units at an average density of 39 per square mile (18/km²). The racial makeup of the county was 76.0% White, 13.2% Black or African American, 0.5% Native American, 1.1% Asian, 0.0% Pacific Islander, 7.1% from other races, and 1.9% from two or more races. 13.0% of the population were Hispanic or Latino of any race. The median income for a household in the county was $56,038. The per capita income for the county was $29,991. About 12.2% of the population were below the poverty line. According to the U.S. Census Bureau, the county has a total area of 709 square miles (1,836.3 km2), of which 683 square miles (1,769.0 km2) is land and 26 square miles (67.3 km2) (3.69%) is water. The county lies totally within the Piedmont physiographic region. The topography of the county is generally gently rolling with several higher hills rising above the general terrain. One of these hills, Terrells Mountain, on the Orange County line is the transmitter site for several radio and tv stations for the Raleigh-Durham market, including WUNC-TV 4, WDCG(G105), WKSL (93.9 Kiss FM), and WUNC 91.5 FM (NC Public Radio). The county lies within the Cape Fear River drainage basin. The Cape Fear River begins in the county near the community of Moncure, at the confluence of the Haw River and the Deep River below Jordan Lake. B. Everett Jordan Lake, a major reservoir and flood-control lake, is located within the New Hope River basin and lies mainly in eastern Chatham County. The lake is owned by the US Army Corps of Engineers and is partially leased by the state of North Carolina as Jordan Lake State Recreation Area. The county lies in the Piedmont area of central North Carolina. Much of the eastern part of the county lies within the Triassic Basin, a subregion of the Piedmont. Much of the bedrock in the county is volcanic in origin and formed during the Triassic period (hence the name). The Triassic origins have led to the formation of coal deposits in the southern part of the county. The Boren Clay Products Pit just north of Gulf in extreme southern Chatham County is a place where Triassic flora fossils persist  The volcanic origins also led to the creation of high amounts of metamorphic-based rocks in the county. The county lies on the Carolina Slate Belt. Soils in the county are mostly clay based and have a deep red color, as do most soils in the Piedmont. Groundwater in the county is generally full of minerals and tends to be "hard" if not softened. Mineral-based water was the attraction at Mt. Vernon Springs during the latter part of the 19th century and the early part of the 20th century. A resort spa was established at the mineral springs. Visitors would drink the water in the hopes of curing ailments and diseases. The resort closed in the early 20th century and is now gone. The springs are still there and are maintained by a local church. Chatham County has managed to retain its rural character in part because it is not served by an Interstate Highway. However, Chatham County plays an important role in regional transportation due to its close proximity to the geographic center of North Carolina and to major cities such as Raleigh, Durham and Greensboro. Though driving is the dominant mode due to the county's rural nature, residents enjoy a number of transportation options. The main east-west artery serving Chatham County is U.S. 64, which provides access to Siler City and Pittsboro. U.S. Routes 421 and 15-501 run in a north-south direction through the county; U.S. 421 serves Siler City and U.S. 15-501 serves Pittsboro. During the 1990s and early 2000s, the NCDOT invested more than one hundred million dollars upgrading U.S. 64, U.S. 421 and U.S. 15-501, which had previously been two-lane roads, to multi-lane highways. There is now a U.S. 64 bypass north of Pittsboro; a similar freeway diverts traffic on U.S. 421 east of Siler City. Chatham County is served by two public transit providers - Chatham Transit Network and Chapel Hill Transit. Chatham Transit Network (CTN) is the Community Transportation Program for Chatham County, providing fixed route and human service transportation. CTN's fixed route provides weekday service between Siler City, Pittsboro and Chapel Hill. Similarly, CHT's new PX route, established as a demonstration route mid-2009, provides weekday fixed route service between Pittsboro and Chapel Hill. Chatham County provides many scenic bike routes along the county's rural highways. The American Tobacco Trail also traverses the northeast corner of the county. Siler City Municipal Airport (5w8) is located 3 miles (4.8 km) southwest of downtown Siler City. This public access airport is home to several single and multiengine airplanes. The county is served by both Norfolk Southern Railway and CSX Transportation. Norfolk Southern serves Siler City, Bonlee, Bear Creek, and Goldston as a part of a spur line that runs between Greensboro and Sanford. CSX serves the Moncure area on trackage that runs between Raleigh and Hamlet. Oddly enough Pittsboro was once served by the Seaboard System Railroad (the predecessor to CSX), but the tracks were taken up in the 1970s and were never to return. In addition to those mentioned below, the communities of Pittsboro, Siler City, and Goldston operate parks and other recreation facilities. ^ Bishir, Catherine (2005). North Carolina Architecture. UNC Press. p. 38. http://books.google.com/books?id=NccTgQkmPIEC. This page uses content from the English language Wikipedia. The original content was at Chatham County, North Carolina. The list of authors can be seen in the page history. As with this Familypedia wiki, the content of Wikipedia is available under the Creative Commons License.